Those pesky camels are making news around the world. This is an African interpretation of a BBC story. I'd say it's gone from English to another language and back again. I'm calling those animal welfare groups animal gratification groups from now. The Australian supervision has due a bill to exercise a long-standing devise to winnow the country’s camels by sharpened them. Animal gratification supporters reject the plan, but people pity the rural area with the camels call them a menace. They were initial brought there in the mid-19th century to assistance explorers span the desert. But there have been right away suspicion to be over one million in motion the outback. That is rounded off one camel for each twenty people, and the race is set to stand in over the subsequent decade, unless a little form of movement is taken. In remote communities they have been seen as a heavy menace, trampling foliage and spasmodic ripping up H2O pipes, as they poke for food and water. 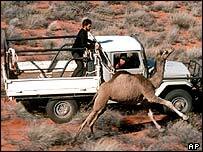 So the Australian supervision has set in reserve $16m (£9.7m) to enclose the complaint and one offer is to fire the camels from helicopters or on foot. Animal gratification groups have been against to a mass slaughter. They have referred to an additional some-more benevolent alternative: bieing born control, giving animals a drug to describe them infertile.